Instagram is certainly no stranger to the world of fashion. It’s been used by Burberry to unveil a new collection, it got a backstage pass to New York Fashion Week, and has even been used by a Brazilian designer for an entire fashion shoot. It comes as no surprise then, that Dutch entrepreneur Roeland de Jong has developed a site that caters to the fashion-oriented Instagrammers. 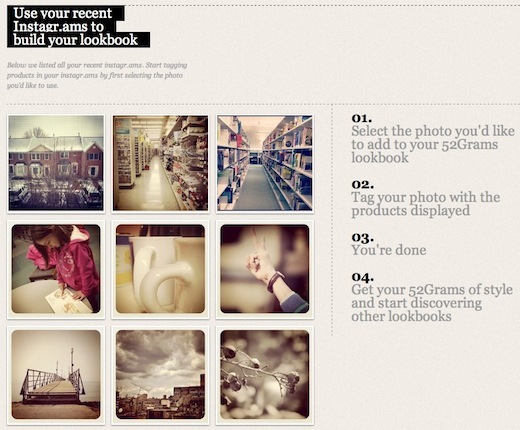 52grams, which launched in beta last week, gives Instagram users a place to display and share their fashion ‘lookbooks’ – all taken using the iPhone camera app, Instagram, of course. So how does 52Grams work? Just connect the site to your Instagram account, and you can pick and choose which of your photos will go into your lookbook. This allows users to have complete control over which images appear, and it doesn’t affect your regular Instagram activities as non-fashion related images do not have to appear there. We spoke to Roeland to find out a little bit more about 52Grams, and why he started it. He told us, “It is really a by-product of a project we’re looking to launch soon – Fashionqlic“, a site which brings the concept of shoppable videos to its users. Roeland continues, “I believe the integration of social functionality is vital for whatever start-up you’re launching, so we started to look at the technologies that social platforms are providing”. Why the name 52Grams? Roeland explains its origins, “The name 52Grams came naturally. Honestly, Instagram allows you to use either “insta” or “gram” in your brand/projectname to create an association with their APP/Brand. Most initiatives have been building there names on “insta…” something. As it is now, 52Grams is a little barebones. 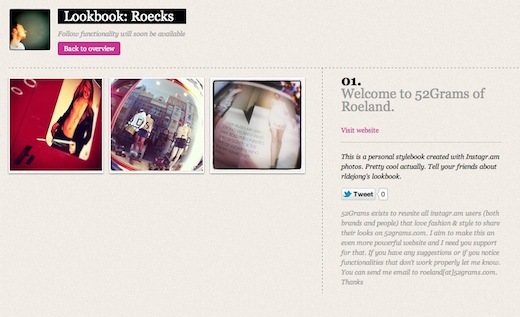 The only way to check out other lookbooks is by going to the ‘Discover‘ page. With the site completely quiet right now, it wouldn’t be hard to scroll through the accounts and find the photos you want to look at. However, once it begins to grow, a more intuitive manner of finding other users whose styles match yours will be needed. There is one new feature that can be expected soon, and that is a Twitter-like option to follow other users. What do you think of 52Grams? Let us know in the comments.